Posted on December 3, 2014 at 12:00 am. We all know that everyone could use a little help around the Holidays, so for this Event I’ve teamed up with more of your favorite bloggers to be your Santa’s Little Helper… giving away prizes that anyone would want to see under the tree! 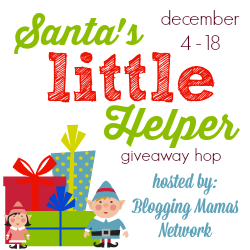 You might find the perfect gift for a little one on your list – or even for yourself, so hop around to all the blogs on the linky at the bottom of this post and don’t miss the Santa’s Little Helper Grand Prize from Step2!